Publication : June, 2012 by Entangled Publishing. Single, homeless and jobless, Indo-American Shari agrees to her best friend's whacky scheme: travel to Mumbai, pose as Amrita, ditch the fiancé her traditional Indian parents have chosen. Simple. Until she's mistaken for a famous Bollywood actress, stalked by a Lone Ranger wannabe, courted by an English lord and busted by the blackmailing fiancé. Or so she thinks, until the entourage of crazies follows her to the Big Apple and that's when the fun really begins. Shari deals with a blossoming romance, an addiction to Indian food and her first movie role, while secretly craving another trip to the mystical land responsible for sparking her new lease on life. Returning to her Indian birthplace, she has an epiphany. Maybe the happily-ever-after of her dreams isn't so far away? 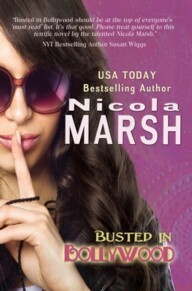 I spent the first 15 minutes after I finished reading this book trying to google everything I can about Nicola Marsh. I couldn't help it, I had to know if she was Indian. Sadly, I still don't know. Only thing I could find out about her was that she's from Australia. All I can say is, if she's not Indian, you'll never guess it because she has done a fantastic job with this book. Bused in Bollywood has so found a place on my favorites shelf. Really, there's nothing not to like love. The story begins with Shari having drinks with her friend Amrita before she leaves for Mumbai, where she'll be impersonating Amrita to help break off her engagement to a man she has never met. I know, it sounds crazy right? But Shari has her own reasons for agreeing to Amrita's insane request; she's hoping to find some clarity. After being dumped, fired and kicked out by her ex-boyfriend/ex-boss/ex-landlord (yeah, it's all the same guy), it's understandable that she's a little shattered so a trip to Mumbai could be just what she needs right now. 'Look up stupid in the dictionary and you’ll find my picture. Along with revealing stats: Shari Jones, twenty-nine, five-seven, black hair, hazel eyes, New Yorker. Addicted to toxic men like my ex, cheesecake, and mojitos (not necessarily in that order), and willing to do anything for a friend, including travel to India and impersonate aforementioned friend in an outlandish plot to ditch her fiancé. Marsh had me hooked right from the very first line. Believe me, you don't want to be drinking anything while you're reading this book. I'm embarrassed to admit this but Shari's narration was so hilarious that I was snorting water on my iPad. Personally, I loved everything about this one. You'd think that it's because I'm from India but frankly, I've read a ton of books that're kind of based on India and I've usually found myself bored with most of them. So yeah, I'm not biased. Marsh has captured the fun/entertaining side of the Indian culture perfectly; her descriptions - right from the food, people and country - are so vivid that they truly paint a picture. However, the two things that really made this book are Shari - I absolutely loved her character/personality - combined with Marsh's awesome writing (refer to the above-mentioned quote for a sneak peek). Busted in Bollywood is fun, colorful and entertaining. It's the kind of book that'll have you grinning stupidly while feeling all warm and gooey on the inside. Reading this lifted my mood so I hope others can appreciate it the way I did. Thanks for taking the time to read and review, Anjana. I'm rapt you loved Busted in Bollywood.